APS’ and TEP’s solar programs are restricted, but could still undercut private solar firms. 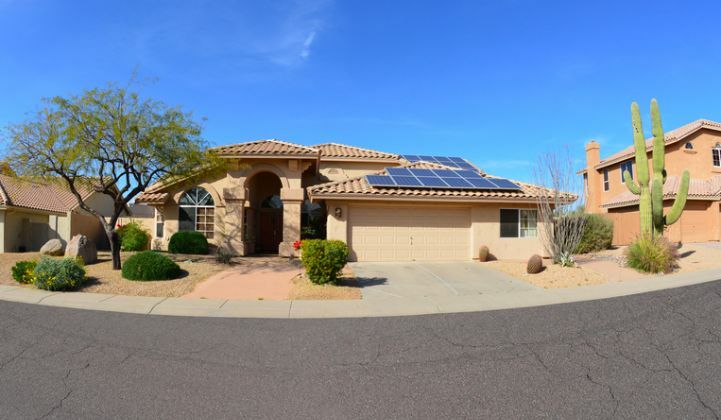 Arizona regulators gave the state’s two largest utilities the green light to enter the residential solar market last week, a move that allows regulated utilities to compete directly against third-party installers. The decision could be the start of a trend for rate-based rooftop solar, as regulated utilities around the country look to build their own solar portfolios. The Arizona Corporation Commission (ACC) voted “no objection” on Friday to Arizona Public Service’s $28.5 million proposal to own 10 megawatts of residential solar systems. Customers that rent their roofs to the utility will receive a $30 credit on their bill each month for up to twenty years. APS’ original proposal was double the size, with a request to own 20 megawatts of rooftop solar. After a critical review from ACC staff, APS revised its target downward and agreed not to pursue cost recovery for the initiative through Arizona’s Renewable Energy Standard surcharge. The commission’s decision not to oppose the plan, rather than to approve it outright, means APS will need to show that the investment is prudent before seeking to recover expenses in its next rate case, scheduled for next year. On Thursday, the commission endorsed a separate proposal from Tucson Electric Power (TEP) for 3.5 megawatts of rooftop solar. Rather than give customers a monthly credit, participants will be charged $250 then locked into a set rate for up to 25 years based on their average historic energy usage, unless their energy use changes by more than 15 percent. The fixed price could allow customers to generate significant savings if TEP’s rates increase in future. Unlike APS’ one-time-only 10-megawatt proposal, Tucson Electric Power (TEP) will be able to purchase 3.5 megawatts of solar on a recurring basis. However, TEP’s program is limited, at least initially, to 600 of its 414,000 customers. The ACC also mandated that both utilities limit their programs to research projects and to ratepayers with low credit scores, and that they offer solar at cost parity with the existing market. Compromise measures added by the commission were designed ensure APS and TEP don’t have a blank check when it comes to rolling out rooftop solar projects. "I wouldn't support this if I thought it would hurt the ratepayers," said Commissioner Robert Burns, speaking at the APS hearing. Theoretically, the two programs could ease the conflict over net metering, which utilities say shift costs to non-solar customers. Utilities could also gather valuable data on solar deployments that will allow for better, cheaper maintenance of the grid. Solar industry advocacy groups, including the Alliance for Solar Choice (TASC) and Tell Utilities Solar Won't Be Killed (TUSK), praised the ACC for preventing utilities from using ratepayer dollars for unrestricted rooftop solar programs. But while the approved plans were more limited in scope than the original proposals, the decision could still undercut national solar firms working in the state. APS and TEP have both said they will contract with local installers to build their systems, shutting out industry leaders. By protecting the utilities’ relationships with their ratepayers, the projects could also make it harder for solar companies to acquire customers in future. Private installers and their allies argued it was unfair to let government-backed monopolies compete against the entrepreneurs that forged the residential solar market, particularly now that the cost of solar panels and project installation have come way down. Arizona is an emerging market, “the utility knows it; that’s why they want to come in now,” said Court Rich, an attorney for TASC, in his testimony against TEP’s proposal. SolarCity representatives testifying along with Rich argued forcefully against the need for utility-owned rooftop solar. If the projects are purely for research purposes, SolarCity said it would willingly give Arizona utilities access to data from their existing installations, as the company has done with Con Ed, SDG&E and SCE, to determine where and how solar can add value to the grid. Commissioner Brenda Burns diverged from her colleagues and opposed both APS' and TEP’s plans, claiming they weren’t necessary to meet the state’s renewable energy targets and would likely add costs to the rate base. Burns and Commissioner Gary Pierce, both Republicans, will be replaced next year by two new Republican commissioners, Doug Little and state Rep. Tom Forese. The largely conservative commission will oversee any future changes to the state’s rooftop solar policies and will probably attempt further reform of the state’s net metering program, which is unlikely to do rooftop solar firms any favors going forward.